Colombia went back to the polls on March 9th to renew its Congress and elect representatives to the Andean Parliament. However, those were not the only things renewed: accusations of fraud and a mistrust of the electoral system were as well. In the past years, vices old and new have affected the nation’s voting processes, some of them founded and some the product of political speculation; however, they all have damaged voting as an institution. Nine weeks from the presidential elections (scheduled for May 25th), the National Civil Registry has had to face a wave of accusations of alleged fraud committed by several parties, such as Centro Democrático, Unión Patriótica (UP) and Polo Democrático Alternativo (PDA). There have been allegations of vote buying, voter intimidation, delays in the issuing of credentials for witnesses, threats to political leaders, problems with the quick vote counts, and even accusations regarding the audit phases for the biometric identification system and the tallying software (a computerized solution for ballot pre-counting, tallying and digitalization). Centro Democrático, the political party of former president and now senator Álvaro Uribe, presented an extensive report on irregularities, a part of which has made the headlines: the alleged omission by the National Civil Registry of 250 thousand votes for the party during the pre-count stage. The accusation was dealt with by the Registry, by indicating that “a distinction must be made between pre-counting and tallying”, only the results of the latter being legal. That is to say, the pre-count used to announce electoral results on Election Day is not precise. For this reason, the Colombian vote pre-count has traditionally generated doubts about the results, since they sometimes differ from the final tally. During this process, the poll workers count the votes and fill two separate forms. The first one, the so-called “vote counter”, has a series of boxes where the votes for each candidate are marked one by one, resulting in a total. This is written on another form (the official statement of the vote). The numbers on the “vote counter” are what is broadcast to the population on Election Day, while the official tally is still taking place. The complaints made by some Colombian parties about the legislative elections are not new; they have arisen in other elections. The National Civil Registry, trying to improve part of the voting process, invested in biometric identification devices, since voter impersonation had tainted several elections. An example of the effectiveness of this technology is that after using it in 59 local elections to validate the fingerprints of over 5 million voters, the number of voter impersonation complaints dropped to zero in the municipalities it was employed. Despite these advances, the National Civil Registry must deepen the changes and eradicate, by means of e-voting , the other irregularities that usually compromise elections in the country. The use of technology can minimize human intervention in critical processes, such as filling out pre-count forms, thereby guaranteeing exact results. After several years of testing, research, and even the creation of a Special Commission for voting automation in Colombia, the new deadline for the application of e-voting is 2018, 14 years after the law that allowed voting automation passed. The National Civil Registry affirms that Colombia is already prepared, but the supposed lack of resources (or actual political will) may thwart the institution’s efforts. Voting modernization does not depend on plans or proposals anymore, but rather on the authorities making the decision to strengthen democracy, instead of letting the same old story play out election after election. The Compromís coalition of Valencia, Spain, carried out its primary elections to choose the candidates that will put together its candidacy to European elections on May 25th. 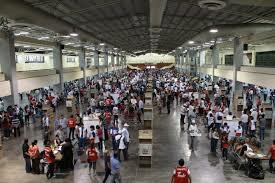 The event combined on-site (manual) voting, postal voting, and Internet voting. The model used was based on the delivery of an e-mail to all registered votes with a customized link that enabled voting by electronic means. Read the news here. El Salvador headed to the polls peacefully on March 9th. However, the inability of its electoral system to deliver results on the day of the election has cast a shadow on the event. Unfortunately, a voting system that can guarantee some elections but is insufficient for other electoral process is proving unfit for this Central American nation. The close margin between the candidates competing for the Presidency on the second round, 6,635 votes (0.22%) made the manual voting system fall into public scrutiny. The system comprises the scanning of the minutes to be transmitted to a data center managed by the Spanish company Indra. Although the process worked for the first round carried out in February, the close results in the runoff revealed the weak side of the system: it does not guarantee an official announcement of winners at the end of the event when the race is tight. Having a voting model that works for some elections and not for others is unacceptable for any democracy. It is simple: in order for a system to be catalogued as optimum, it must always perform efficiently. The delay in result proclamation, due to the decision of the Supreme Electoral Court to retake the final tallying, has opened the doors to fraud accusations and petitions of vote-by-vote recounts. Due to the fact that four days had to elapse to declare an official winner, public opinion leaders are beginning a debate on how to guarantee that all future elections are deemed legitimate and fraud accusations are left behind. In Democracy there are no first and second-rate elections, all of them are equally important because they represent the will of the people. El Salvador is facing now a dilemma: whether to follow the path of manual voting or to open up to new technologies and modernize its voting system, as e-voting has been able to resolve elections with a marked political polarization, complex electoral infrastructure, close results, and hundreds of simultaneous candidates, without ever leaving results to reasonable doubt.